Are Far East Movement, Tiger JK, and Yoon MiRae collaborating? 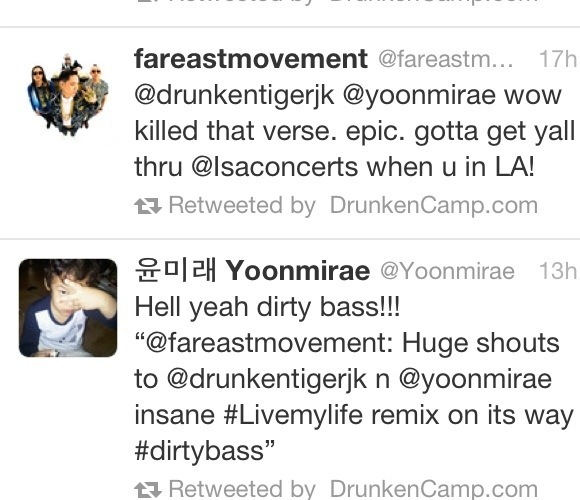 On May 6th, a eyeraising tweet appeared on Far East Movement’s twitter stating, “Wow, Tiger JK and Yoon MiRae killed that verse.” A few minutes later, both Tiger and Yoon MiRae were caught mentioning “dirty bass (a trademark saying of FM)” and trending “livemyliferemix” (in reference to FM’s latest top 10 hit). Could fans be seeing Tiger and MiRae on a FM track soon?